The marina of Manacor hides one of the most beautiful virgin beaches on Mallorca. This is Cala Varques, with a white sandy beach and crystal clear water, surrounded by hills. The beach is small, some 70 metres long and 50 metres wide, but the cove formed by the cliffs has many corners for sunbathing and swimming. In one of the cliffs, there is a cave that is much appreciated by speleologists, comprising different cavities and underwater galleries that total over 500 metres of caves. The cove is well known and can sometimes be visited by cows from a neighbouring farm, an anecdote that has provoked both interest and sympathy, an also controversy and complaints. The reason for this is that the access to the cove passes through a private rural property and it is said that the cows go to the beach to scare the swimmers away so as to avoid massification. 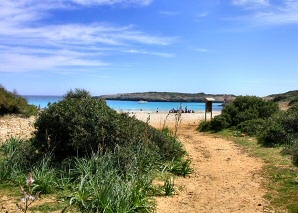 The cove is situated between the towns of Portocolom and Porto Cristo. Leaving from Manacor, you follow the road to Cales de Mallorca and reach a crossroads with the Porto Cristo road. Then you should go towards Porto Cristo for 150 metres before turning the first lane to the right. Following this lane you reach a barrier where you must leave your car and continue on foot for about 10 minutes, along a path that goes through a lovely wood until it reaches the beach.